Leinster's Luke McGrath kicks for territory as Glasgow lock Tim Swinson attempts to block. Picture: SNS. 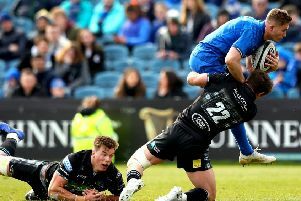 Glasgow coach Dave Rennie was ready to admit that Saturday’s wounding home defeat by Leinster might lead to a shift of focus away from the European Champions Cup come the next round of games in December. He may have to convince some of his players, however, who are reluctant to relinquish hope that a miracle qualification for the knockout stages can still be achieved. “We’re two games in. We still have a chance of qualifying. We’re not going to go down without a fight,” said full-back Stuart Hogg, who was impressive on his injury comeback but was a picture of disappointment as he spoke to the press after the game. This was not the kind of Glasgow we have come to expect in recent years. Last week’s away defeat at Exeter Chiefs had taken the wind out of the sails of a perfect start to the Guinness Pro14 under Rennie but, as the early afternoon kick-off approached on a wet Glasgow Saturday, there was a sense of anticipation that the Warriors would roar back into Pool 3 contention with another big occasion barnstormer. In the end they were outclassed by the three-time champions, with dropped balls and defensive lapses peppering the home display. The sight of fans streaming for the exits five minutes before the end after Leinster scored their bonus-point try as Noel Reid waltzed through a gaping chasm, is not one we have been accustomed to. Hogg, pictured inset, was not shying away from the difficult position Glasgow now find themselves in but, as you would expect from a character who oozes competitive spirit, he is not yet ready to throw in the towel. He wasn’t immune to the errors which ran through the Warriors on Saturday but showed flashes to gladden the heart of Scotland supporters ahead of the autumn Test series. An early electric 30-metre dash down the right led to a penalty which got Glasgow back level after falling behind to a Johnny Sexton effort. Hogg then applied the finishing touch for a well-worked first try of the afternoon. Finn Russell’s clever kick through was touched on by the boot of Tommy Seymour and the full-back needed the last millimetre of Scotstoun’s minimum sized 10-metre dead ball area to get the touch down. Leinster seized the game with brute force as prop Cian Healy barged over to even the game again and then old frailties at defending the driving maul resurfaced as the Irish took a seven-point lead into the break. Glasgow were chasing the game from then on. Sexton finished off a well-worked Leinster try before Hogg’s scoring pass put Seymour in for a brief hint of a fightback. But, by then, there was no doubt about who was the better side on show and Reid’s try put the gloss on a second straight bonus-pointer for Leinster. It leaves Glasgow facing an almost impossible task, their European dream in tatters before the campaign has really got going, which is desperately disappointing following last season’s breakthrough into the last eight of Europe’s elite tournament. The Warriors managed that with two losses, although they at least took a losing bonus from one of those to Munster, but in such a tough pool, with Vern Cotter’s Montpellier next up, it looks like only a maximum return from the remaining four games will give them a chance. “It is indeed [difficult],” conceded Hogg. “But Bath qualified out of our pool a couple of years ago after losing their first two games. We need a lot to go our way, but we’ve got the boys who are more than capable of qualifying. It’s all in our hands. “We’ve made it tough for ourselves, but we’re going to give it a roll and hopefully give ourselves a chance. “I’m bitterly disappointed. We had our opportunities and grabbed a couple of them, but the rest of the time we just coughed up the ball too easily. 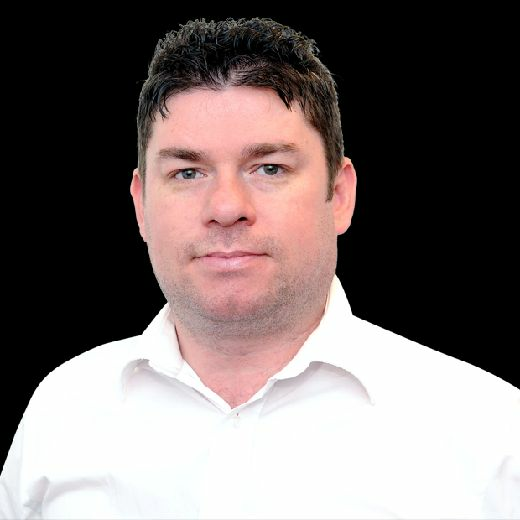 “Credit to Leinster – I thought they were outstanding in the way they managed the game. They put us under a lot of pressure.